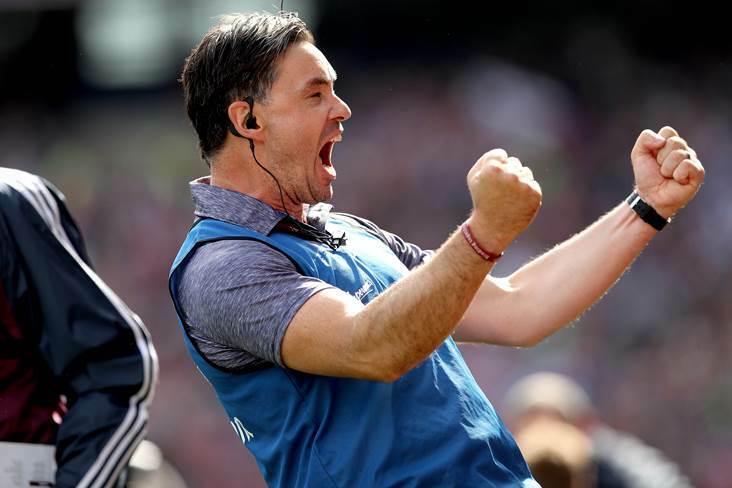 Galway manager Jeffrey Lynskey celebrates. Galway minor hurling manager Jeff Lynskey says he almost contacted the Gardaí recently after an incident involving a player's uncle and a county board official. At the weekend former Kerry manager Eamonn Fitzmaurice explained how he and his players had been the subject to over-the-top abuse. On Tuesday evening ex-Mayo manager James Horan said that he had to get the Gardaí involved over one piece of hate-mail, while Limerick boss John Kiely lets his wife censure the letters he receives from his county's fans. And now Lynskey has exposed some of the more vicious elements regarding young players missing out and the fall-out from that. "Board officials would have been attacked, and that was only about six weeks ago. Verbally attacked over stuff I would have done regarding panels and not picking lads," said Lynskey. "You're thinking, 'Right, is this the time to go to the guards with it to protect myself?' You need to protect yourself. In our school where I work, the principal protects everyone, both staff and teachers. So, for me, the board officials need to protect what we're doing. "So, when people like Eamonn Fitzmaurice comes out and the level of abuse he got, that's wrong. It's not nice. When you've a young family at home that I have and he has, we've young kids. "Now, God help them if they come to my door - it would be sorted out fairly, fairly quick! But you just have to protect yourself and shield yourself. It's a public job. "As Cyril Farrell said to me when I became manager in 2014-15, 'You're now public property and you need to realise that, you just have to deal with it.' I'm quite good; you get a technique after a while, you learn the dos and don'ts. "This type of stuff, now does it concern me? The incident a couple of weeks ago did because of the vitriol that was there and the angst that was there and the toxicity of it. "So I said to myself, 'Right, if I hear another thing here I'm going to move on this." The Galway minors are looking for their third All-Ireland title in four years if they beat Kilkenny at Croke Park on Sunday week. "There's other stuff, parents not coming to functions after All-Irelands are won because their kids didn't make the 26. The big thing is to have the name in the programme and the picture," said Lynskey. "That's huge for some parents. Understandable enough - for some of them it's the be all and end all. But I'm trying educate them that this is only a step on the road. "Some of them will listen to you, they've no issue, they'll absorb it. You would have parents ringing you the night before a match, at 10 o'clock, wondering how come he's not on the 24, why is he not on the team? "But I don't do that. You don't kill the kitten because of what the cat has done. So, you just have to be careful. You have to be very, very mindful of them because they're only 16, 17 years of age." But at underage level Lynskey says it's crucial that there is a link between the management teams and the community too. "There was a lad we missed, and he (a priest) rang me and he said, 'Look, I'm such and such from whatever parish' and I said 'Howya'. He said 'Look, will you do me a favour?' … he told me the back story and I said, 'Look, I'll take a look at him in a club match'," said Lynskey. "And I looked at the kid and I said, 'Do you know what, he has something' and we brought him in. But you have to have that link with people. "If you disconnect yourself completely, then they become a bit disenchanted."